"This is a place that's meant to be used by people who make things." Who doesn't love the library? 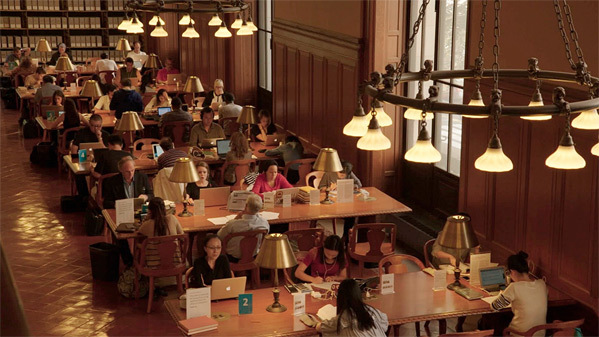 Zipporah Films has released the first official trailer for the documentary Ex Libris: New York Public Library, the latest from legendary documentary filmmaker Frederick Wiseman. As the title clearly indicates, this doc is about the beloved, famous New York Public Library, probably best known in pop culture from the original Ghostbuster movies (the opening sequence takes place there). Wiseman's extensive 4-hour film examines the history and the legacy of the library, taking us inside the walls and down the many corridors. Did you know that the New York Public Library system actually has 92 branches spread around the five boroughs? This seems like an utterly fascinating and sublime doc about the glory of libraries, and the power they have. The legendary doc filmmaker brings his incisive vision behind the scenes of one of the world's greatest institutions of learning, capturing the vast programmatic scope of NYC's library system. The NYPL is blessed with uniformly passionate staff and deeply devoted, appreciative bibliophiles and beneficiaries across its 92 branches. The film reveals a venerable place of welcome, cultural exchange, and intellectual creativity. Ex Libris: New York Public Library is directed by legendary documentary filmmaker Frederick Wiseman, of many films including Titicut Follies, High School, Law and Order, Hospital, Missile, Blind, Ballet, Public Housing, The Garden, La Danse, Crazy Horse, At Berkeley, National Gallery, and In Jackson Heights previously. This will first premiere at the Venice and Toronto Film Festivals this month. Zipporah Films will then open Frederick Wiseman's Ex Libris in select theaters starting September 13th. Curious?